I have been speaking with Willow Glen residents and Lincoln Avenue small business owners this week about the controversial Road Diet. I have yet to meet anyone local who is in favor of the Road Diet; however, I have heard many stories about accidents and almost-accidents due to crowded and fast traffic on Lincoln Avenue. I illustrated my Road Diet Failure blog post (19 May 2016) with photos of trucks parked in the center passing lane on Lincoln Avenue – a frequent traffic-blocking occurrence. 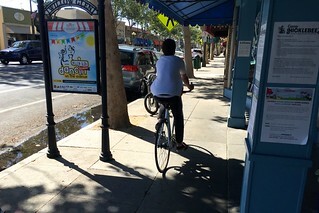 This post is illustrated with bicyclists avoiding the two bike lanes on Lincoln Avenue – riding on the sidewalk among the pedestrians rather than in crowded road traffic. 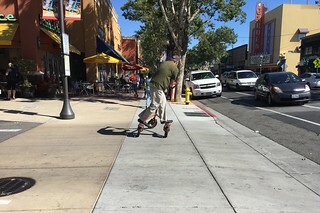 Also included is a photo of the 3-wheel cycle rider who often does dangerous trick riding on Lincoln Avenue sidewalks. 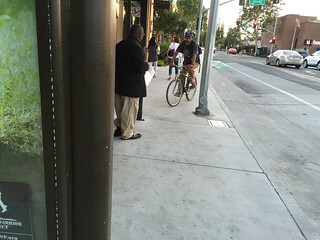 I have never seen a cyclist cited by police for riding on the sidewalk. The Road Diet Working Group website has not been updated in a year. I understand from the San Jose Department of Transportation that a full analysis of Road Diet crash and safety data will be made available by the end of June 2016, updating the most-recent report now posted on their website (dated 1 June 2015). I am looking forward to seeing current information. The following history and analysis of the Road Diet is published with the permission of Allen Rice – who submitted it to the City of San Jose last year. I added and corrected web links. There is a Stand Up for the Neighborhood – End the Willow Glen Road Diet Facebook page for updates and discussion. 11/12/14 WGBA Board meets. The agenda for this meeting contained an item, “Proposed Road Diet Test”, for Approval. We could not find this agenda as of 8/6/15. (WGNA Minutes 11-12-14) Road Diet as item 4 “The WGBA directed Tom Trudell and the Our Avenue Committee to get input from the community regarding the Road Diet. They met with Chris Roth, WGNA, Tim Mulcahy, and Hans Larsen and John Brazil with the DOT and Pierluigi Oliviero.” The Board voted to go ahead, and Tom Trudell was assigned to create and chair a Road Diet Working Group. 11/20/14, a Community Meeting on the Road Diet is held. Per a flyer about the meeting, WGNA was its sponsor. WGNA does not have the minutes of this meeting, and we have not been able to locate them. 11/21/14, the Road Diet Working Group holds its first meeting, with all members selected. (RDWG Minutes 11-21-14) Of 9 members, 5 are from either WGNA (President, Treasurer) or WGBA (President, Board Member, Our Avenue subcommittee Member). The minutes for each meeting have the recurrent action item “All RDWG members will continue talking with their constituents for feedback to bring back to the group for discussion”. The Road Diet has been accomplished by a small subset of the community, intentionally avoiding the “costly” formal process. Limited from the outset by a limited amount of “found” money, the “Test” was constantly limited in its scope. 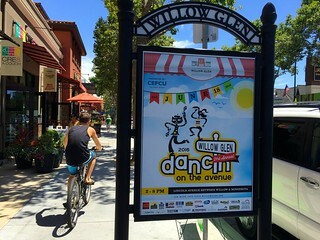 The Willow Glen Community, was told from the beginning that the Road Diet was a TEST, with two possible outcomes. IF 1) both WGNA and WGBA felt the test was successful, then its results would go before the City Council for a decision on whether it should be made permanent. But, IF 2) either organization voted against, the 4-lane configuration would be returned and the Road Diet would NOT be presented to the City Council for action. The manner in which the Road Diet was created is highly suspect. The WGBA voted against. Out of a due respect for process and community, we expect the street to be re-striped, in the original configuration, no later than October 2015. Click here to see the entire Willow Glen Road Diet Series. We need more people like you to support this behavior by our City Council. They don’t respond to emails. THey all claim they have small business at heart and we need to get to the truth before everything they want comes home to haunt us. Thanks for all you do. Has the Road Diet affected neighborhoods other than Lincoln between Pine and Willow? We have been told no, and that “studies” have been done that substantiate this. However, if you compare Google Traffic Analytics, and look at a typical weekday morning between 8am and 10am, the pre and post Road Diet effect is undeniable. As our friends and neighbors have observed, traffic has changed for the worse. The Google traffic map proves this. When you look at a typical Monday at 8:30AM you see green where there was never enough traffic to be warrant green; and red throughout Willow Glen where there was never red. It is quite obvious when looking at this traffic map that it is motorists avoiding northbound Lincoln and using the surrounding neighborhoods to go around the new bottleneck of two blocks of Lincoln. Which streets? Pine, Bird, Newport, Hicks, Minnesota, and Willow are all significantly affected. Those of us who live in these neighborhoods, live the effects. More traffic, faster traffic, worse drivers, impatient drivers, all competing for the safe road space with our children walking and biking to school, with our pedestrians trying to navigate what were once peaceful morning walks. If the adult bikers along Lincoln are so deserving of increased safety measures, on a street that has numerous safety features already at these hours, why do our bicyclists, children and pedestrians not warrant the same concern? Who is the voice for our children placed in greater danger as vehicles bolt into the neighborhoods to avoid northbound Lincoln in the mornings? Who is the voice for them? Where is their leadership and representation? PS…I don’t have Facebook, so if anyone reading this can copy and post to the WG groups I would greatly appreciate it.